It’s amazing how many tarts we have done the past year. If we continue at this rate, we can open a tart shop. Plus, Ned’s confidence in tart-making has grown and the consistency of the crusts are getting better each time. If you place a tart made now with one made before, the difference would be obvious. This is a quintessentially French dessert and a mainstay in many patisseries. How do we know if the patisserie has good pastries? We sample the lemon tart. (We do the same for dim sum restaurants, except it’s the har gao.) Whether it comes with meringue or not, if it’s custard or curd, when done properly, the sublime zingy flavours of the lemon will come through with bursts of sweet and sour. Michael Roux made the famous tarte au citron in which a custard filling is used, and Pierre Hermé’s version had it in a curd-based form. Both were equally delicious but with varying textures. We have plenty of tarte au citron, and found that the tartness of the citrus had a stronger presence in a curd as compared to custard. In a large bowl, with a spatula or wooden spoon, mix the soft butter and icing sugar to a cream; then beat in 2 of the egg yolks. Add the flour and, with your fingertips, rub the butter mixture and flour together to achieve a crumbly texture. Add the water and press the mixture together to form a ball. With the palms of your hands, knead the pastry on a lightly floured work surface until it is blended (maximum 30 seconds – do not overwork the pastry or it will be hard and lose its crumbly texture). Flatten the pastry slightly with the palm of your hand, wrap in cling film and refrigerate for 30 minutes (this helps the dough lose its elasticity). In a large bowl, mix together the eggs, sugar, lemon juice and zest and whisk for a few seconds. Add the cream and whisk it in, then place in the fridge. Rolling out the pastry. On a lightly floured work surface, evenly roll out the pastry into a circle 3 mm (1/8 in) thick. Roll the pastry over the rolling pin and unroll it over a 24 cm (91/2 in) loose-bottomed tart tin. With one hand lift the pastry and with the other gently tuck it into the bottom edge of the tin so that it fits tightly. Be careful not to stretch it. Cut off excess pastry by rolling the pin over the top edge of the tin. Take a small ball of pastry and gently press it all around the base of the tart to ensure a snug fit. Prick the base of the pastry all over with a fork and refrigerate for 30 minutes (this helps prevent shrinkage during cooking). Meanwhile, pre-heat the oven to 160°C/ 325°F/Gas Mark 3. Line the pastry case with aluminium foil and fill with dried beans, pushing them against the side. Bake for 10 minutes, then remove from the oven and lift out both foil and beans. Return the tart tin to the oven and bake for a further 20 minutes. 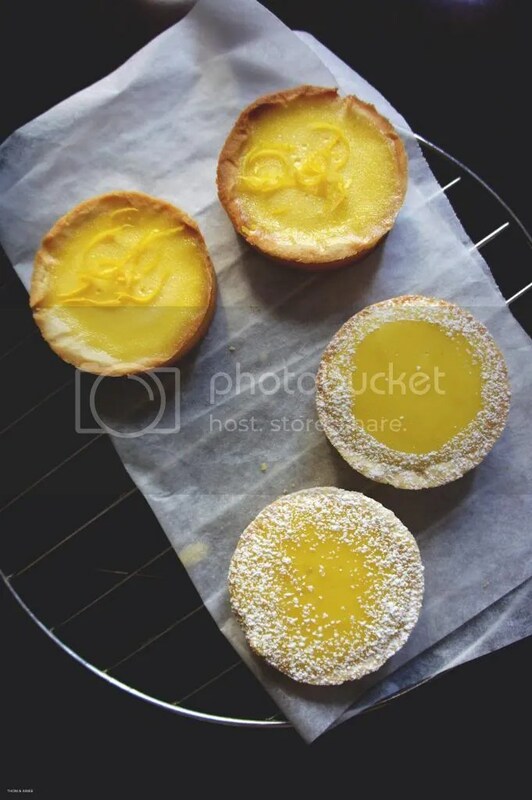 Brush the inside of the pastry with the remaining egg yolk and return to the oven for 1 minute (this creates a seal on the pastry and prevents it becoming soggy when the lemon cream is added). Turn the oven down to 140°C/ 275°F/Gas Mark 1. Pour the lemon cream mixture into a saucepan and warm it gently (this is to speed up the cooking time of the tart), being careful not to heat it too much or it will scramble. Pour the warm mixture into the pastry case and bake for 25 minutes, until barely set. Remove from the oven and leave to cool for at least 1 hour, then dredge icing sugar around the edge of the tart. Remove the tart from the tin and place on a serving plate.